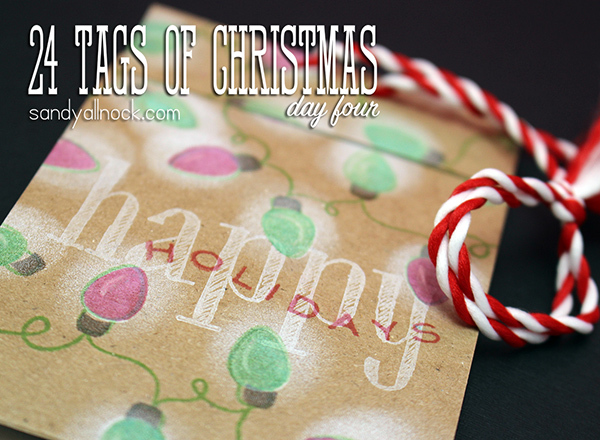 Today’s tag is more than just a gift tag…it would do a great job as a gift card holder too! (Watch the end of the video for that!) I’m picturing a bunch of these hanging on the family tree on Christmas morning with movie theater gift cards in them…a family outing, courtesy of Santa?! Enjoy the video below, or click HERE to watch it in HD on YouTube. If you’ve missed any of the previous tag videos in the series – I’m adding them all to one playlist HERE. All white lights, with Glossy Accents…. And oh so pretty peacock feathers ink! YUM. And do you see that one bulb where it crosses over from one panel to another and the bulbs seem to align? That was totally unplanned, but WAY cool! From the response thus far, it seems this tag series is going over quite well….couple more days to go! 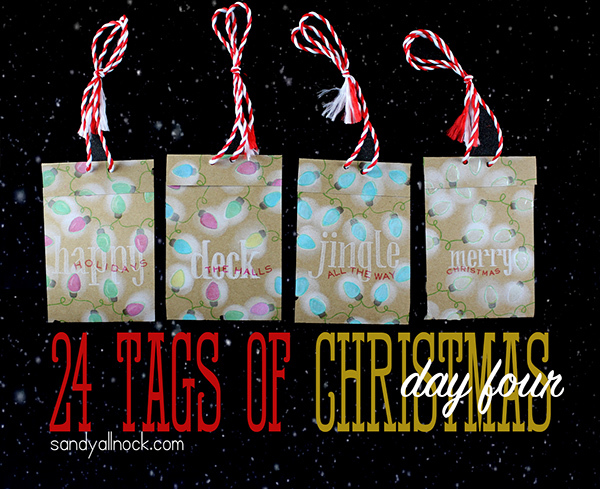 Where can I purchase the stamp set used for these tags. The glowing lights and greets are beautiful. Please help! I love these tags. The bulbs look like they are really glowing! You are so creative! Cool gift card holders. I need several, how beautiful. I forget that you can curve those clear stamps. Neat technique! Thanks for sharing!! Oh these are soooo cool! Love the effect with the white ink! Do you those absorbers dry or with some cleaner? I haven’t gotten any of the WPlus9 stamps yet, but every one I see looks better than the last. Adding them to my list. I love these. The lights look so great. Oh my! I want to make these! Can’t wait for the stamps to get back in stock! 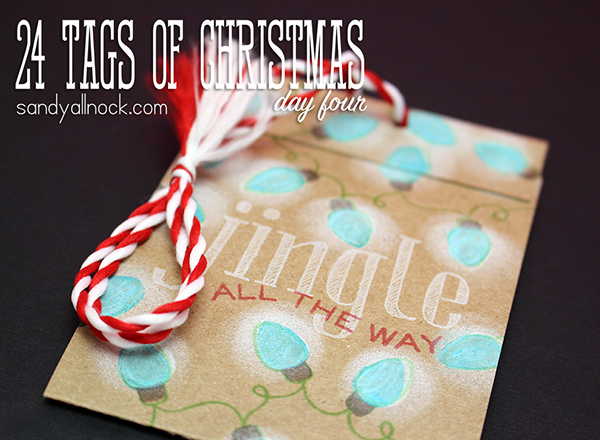 I can’t wait to make them – which means I’ll actually get some of my tags done for next year done before December 2015! Ok….which did I say is my favorite…thought it was day 6 ( since that is where I started)….OMG…I love them all so far…I am HOPELESS….OH WELL….they are all my faves…..MERRY CHRISTMAS EVERYONE!!!! Thanks Sandy!!! Very pretty and festive. I like that they double as gift card holders. 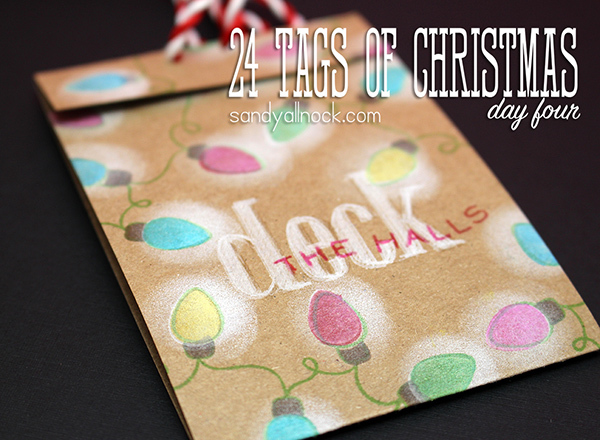 Love all the lights on the tags – cool! I love white on Kraft. These lights take that concept up another notch. Gorgeous! Love this tag and technique. 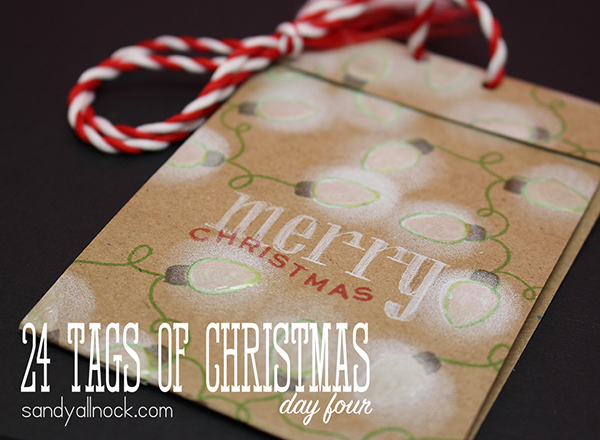 I also love that it holds a gift tag! I would love to win one!